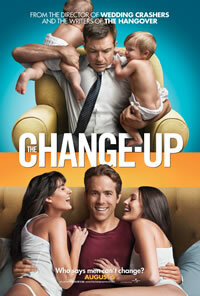 I’m getting a distinct “wouldn’t it be great if…” Hall Pass vibe just from the plot description for this film, but I’m hoping it will all be taken less seriously as Wedding Crashers helmer David Dobkin directs Ryan Reynolds and Jason Bateman in the sure-to-be-raunchy body-switch feature The Change-Up due out on August 5. The film centers on two friends that have followed different life paths. One got married and had kids (Bateman) while the other remains a womanizing man-child (Reynolds). One drunken night (which means they’ll wake up from the dream they are having at the end of the movie) they awake to find they have switched bodies and lives and suddenly realize the life the other had wasn’t all it was cracked up to be. Today Universal debuted the first R-rated trailer for the film, sent over the poster you see here as well as one more new image. You can browse a larger version of the poster and the new image in our gallery right here and watch the trailer directly below. Like I said in the opening, the plot description reminds me a lot of the lessons learned in Hall Pass, but I didn’t watch the trailer. Tell me if I’m way off and what you think in the comments below.